"Dried foods contain more nutrients than canned foods. Canned foods retain only 40% of their vital nutrients, frozen foods-60% and DEHYDRATED A WHOPPING 97%!" Durable American Made. All components are made and assembled in the United States of America. The experts agree, the Excalibur is the #1 choice in food dehydration for efficiency and cost! Please note that we only sell the Deluxe Units as they have a better quality motor and will out perform the Basic units. Also the price difference is minimal. Do you already own a dehydrator? Do you use it? If you are like me, I had a cheap model that had left me with poor results leaving my food to spoil and feeling like dehydration doesn't always work for long term food storage. After 10+ years of being frustrated and giving up, we took a day long class on dehydration to learn what we were doing wrong. Boy, was I surprised to learn that it wasn't "us", it was the cheap, poor performing, dehydrator we owned. Our instructor with 25 years of experience teaching the class and putting up thousands of pounds of food, said she owned 4 Excaliburs and it was, by far, her "machine of choice"! We bought one that day and it has changed the way we put up food storage. Now, we can easily take advantage of store sales, farmer's market abundance and our own garden produce without exhausting ourselves with the tedious job of hot canning that leaves your food "lifeless" and you hot and tired. Best of all,we can add to our storage pantry many items that are not readily availbale to purchase. So, if you are not happy with your dehydrating results, the Deluxe Excalibur could well make the same difference for you. Are you wondering what foods you can dehydrate in the Excalibur? fish, herbs, and some dairy products. You can dry everything that you see dried on the grocery shelf: Dried apricots, pineapple, peaches, prunes, pears, dates, garlic, onion, peppers, spices, raisins, meats, fish and more. You can make fruit leathers, crackers and even dehydrate stews and sauces! How much electricity does the Excalibur consume? Why spend hot summer days canning when you can effortlessly dehydrate!! From the first stalk of rhubarb to the very last pumpkin. If you garden, your Excalibur Dehydrator will be your constant companion from early spring to late, late fall. Pick a little, dry a little, from one end of the season to the other. When winter chills bring gardening to a close, turn to other uses for your Excalibur. During the lull between growing seasons, try your hand at crafts, jerky, holiday ornaments, just to name a few. The Excalibur makes sense for NON-GARDENERS, too! Those who garden have easy access to Nature's bounty. But don't feel badly if you don't garden: with the Excalibur, you can enjoy all that goodness and nutrition, too. Stock up at harvest time. Save money! Fancy fruits and vegetables are pricey out of season. That's because they're perishable and must be sold when they're ready. Take advantage of the over abundance, in-season, by capturing all that healthy wholesomeness with your Excalibur. 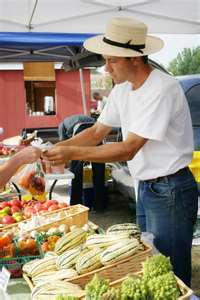 In addition to your grocery isles, check your local farmer's market, roadside produce stands, and be sure to check with your gardening neighbors. One of your friends may be searching for someone to share in their bountiful harvest. The last thing most gardeners want is for their excess produce to go into their compost bins. It's not uncommon for an avid gardener to harvest hundreds of pounds of plums or tomatoes all at once -- far more fresh produce than any one family could dream of consuming. What do you do with all that abundance? Millions of gardeners give away tons of extra veggies - Save it for yourself - DEHYDRATE It ! and are easy to use in recipes all year long. 5 LARGE trays: 8 square feet of tray area. with a black door and black trays. Perfect for families with small gardens and a few fruit trees. Available in case color Black or Appliance White. All units come with a Black door and black trays. Order now and receive for Free the all important book "Preserve Your Harvest", a $24.95 value. 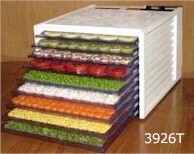 This book contains everythng you need to know about dehydrating hundreds of fresh fruits, vegetables, meats, stews etc. and how to preserve them using your Excalibur.